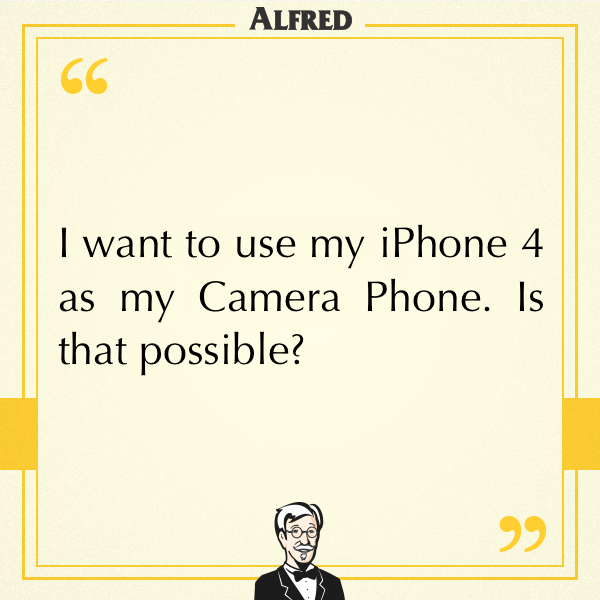 Can I Download Alfred on iPhone 4? - Frequently Asked - Alfred Center | get the most out of the best home security app! Can I Download Alfred on iPhone 4? I want to use iPhone 4 as my Camera Phone. Is that possible? Alfred believes in providing security for everyone, which is why the team tries to make Alfred available on as many devices as humanly possible. However, as anything under iOS 8 has difficulties supporting all of Alfred’s awesome features, we had to set the minimum at iOS 8. Unfortunately, that means we’ve had to exclude iPhone 4! There are some “jailbreak” methods that could potentially update the iOS of iPhone 4 to 8, and we have had users successfully downloading Alfred that way. However, at least in the cases we know about, Alfred couldn’t function normally. We are sorry for the inconvenience if you happen to have an iPhone 4 lying around! Please know we have tried our best. If you have actually managed to upgrade your iPhone 4 and make Alfred run smoothly, please let us know because we’d like to check it out as well! How to install Alfred on iPhone 4?